Popstar Demi Lovato has cancelled the reamining dates on her Tell Me You Love Me World Tour in South America to focus on her recovery, following a drug overdose last month. The world was shocked when news broke that Lovato had suffered from a drug overdose. On July 24, the singer was found unresponsive at her Hollywood Hills residence when authorities and paramedics were called to intervene. When TMZ first broke the story, it appeared to be a heroin overdose, but it was later confirmed by a source that it was not heroin. However, she was reportedly given Narcan, which is used to counter the effects of opioids. Following the overdose, Lovato was recovering in a hospital for almost two weeks until she was released a few days ago. She has since checked into a rehab facility. While the length of her treatment is unknown, the star has decided to cancel the remaining dates on her 2018 tour. She was supposed to head to Mexico late September and play gigs across South America through the end of November. In addition to the shows in South America, Lovato was also scheduled to perform in Atlantic City, New Jersey two days after her overdose, but the show was cancelled. Fans still attended however, and sang “Sober” outside of the venue in support of the star. Since the incident, a huge conversation about addiction has sparked across all forms of social media, and stars have begun to implement new ways to prevent this from happening. Britney Spears even tightened up her drinking rules on her “Piece of Me” tour by setting strict guidelines that no alcohol could be served backstage. 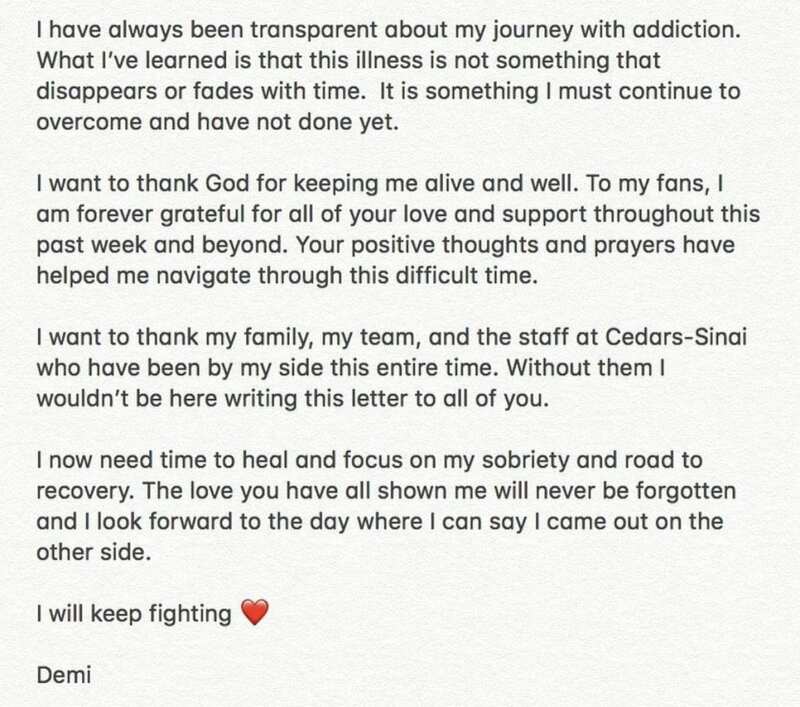 Lovato broke her silence just a few days ago by posting a note to her Instagram, explaining her gratitude toward her fans and her struggle with addiction. It is likely that Lovato will be out of the limelight for the time being while she begins her recovery.